You are here: Home » How to Enable Multiple Gmail Account Support? How to Enable Multiple Gmail Account Support? Have I mentioned I love Gmail? Gmail makes up for its dull look and feel with powerful functionality to handle the email volumes of this day. 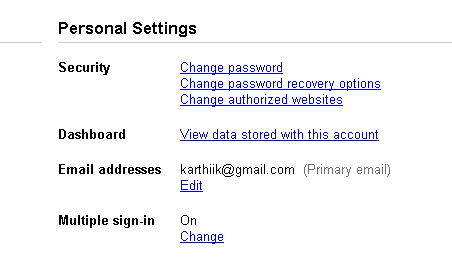 But, as most Gmail users I have multiple Gmail accounts and it is a pain to switch between them. I hate to have to logout of one account and login to another just to logout and log back in again. This can get extremely tiring if you have to do this dance multiple times a day. Of course, I used the cool Gmail Greasemonkey scripts that lets me switch between multiple accounts but it didn’t always work across all of Google’s services. Curiously, support for Google Docs is missing at the moment. Let’s look at how to enable this. Read and check the boxes shown in picture and save changes. Go to Gmail and refresh the page and you will a dropdown next to your email address at the right top side. Choose sign in to another account to add multiple email logins. As noted in the warnings, make sure you understand you can’t use offline access with this enabled. Also not all Google products support this. With this enabled, make it a habit to check that you are working on the desired account. Also, it doesn’t look like this support extends to Google Apps either. This is really a mystery to me, because my G-mail dashboard isn’t even displaying a Multiple Sign-in option under Personal Settings. Not sure why that would be, but I’d love to be able to use this option since it would make switching between my personal e-mail account and my blog’s e-mail account so much easier. Currently, I’m using the Google Chrome browser, which you’d certainly expect to be compatible with G-mail. Up until recently, GC would auto-fill the password field when I switched between accounts, because I’ve selected the stay-signed-in option. But lately, since I’ve let others use my computer to check their G-mail messages, GC has stopped filling in my passwords for me, making me have to manually type them in each time (a rather annoying development). This was always such a time saver, though I’m sure the Multiple Sign-in option would be even more convenient. Wondering why this option doesn’t seem to be available to me. Any ideas? Could it be that I need a G-mail upgrade and don’t know it? Is that something we’re responsible for doing manually? Or does it have something to do with the fact that I’ve opted to use a secure (https) browser connection? Jeanne, this is a brand new feature and it is entirely possible that Google is rolling this out to users in batches. I’d wait a little bit to see if Google enables it for everyone. Oh, that explains it! Didn’t realize it was brand new. Guess I can be patient a little longer. 🙂 Thanks for letting us know about this great new G-mail feature!